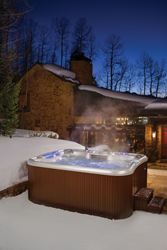 It’s exciting to be part of the Sundance Spas family” said Joe Refosco, Taylor-Made Owner. “The vast selection and superior product is a perfect fit with our need to serve vacation rental owners and those looking for a spa for a private residence. Taylor-Made Deep Creek Vacations & Sales is a Deep Creek Lake vacation rental and real estate company that has recently launched a hot tub sales division to serve second home owners at Deep Creek Lake as well as residents of the surrounding tri-state area. As an authorized dealer of Sundance Spas, Taylor-Made can easily help buyers determine which hot tub model best fits their needs and budget. Partnering with Sundance Spas was a natural choice as their commitment to excellence is aligned with the Taylor-Made’s dedication to providing exceptional customer service and high-quality experiences for their vacation rental home owners and guests along with their real estate clients. Sundance Spas is the world’s largest manufacturer and distributer of acrylic spas, and they have received more awards and honors than any other hot tub company. The hot tub sales division at Taylor-Made takes pride in helping people discover the health and lifestyle benefits of owning a product that offers top-notch hydrotherapy. Relaxation, stress relief and the promotion of overall well-being contribute to balanced living for Sundance Spa owners.